Huygens Optics is a single man operation and is run by Jeroen Vleggaar. In my workshop I have all the necessary equipment to make parts from various glasses and ceramics such as NBK-7, S-BLS7, borosilicate glass, quartz, Al2O3, Zerodur, CLEARCERAM and Ceran. I can also machine materials used in infrared applications, like Germanium and Mg2F. Basically all materials from suppliers such as Schott, Ohara and Heraeus can be ordered and processed into parts. A limited supply of borosilicate glass and Zerodur is in stock. Parts can range in complexity from simple to complex (with internal structures). Existing parts, such as optical filters, can be cut to the required dimensions. Parts used in mechanical applications can be modified in size, flatness, or parallelism. Fine grinding can lower the RMS roughness of surfaces to around 0.3μm. The roughness can be further lowered by using pitch polishing. With this method, the surface roughness can be lowered to a few nanometers RMS and a peak to valey (P-V) flatness of 10 nanometers over distances of 250mm. 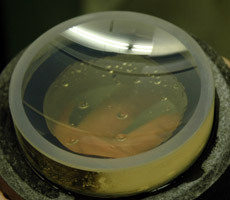 Pitch polishing can also be used to produce spherical- and aspherial optical surfaces. 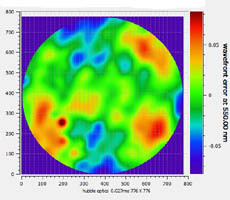 With most common optical surfaces, an interferometric test report can be supplied. The combination of the above properties make them suitable for very demanding applications. Glass and ceramic parts can be used under conditions where plastics and metals do no longer perform well. Which specific material is most suitable for an application is dependent on the customer demands. Huygens Optics has experience in the design of optical systems using simulation software. With this software, the performance and tolerances of an optical system can be calculated and optimized before it is manufactured Prototypes can be based on existing lenses from commercial suppliers, as well as on custom manufactured optical components. 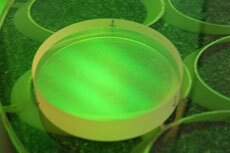 Huygens Optics can also manufacture and test prototypes. For making custom components, a CNC radius milling machine, a polishing machine, an optical centering machine as well as te nescessary tooling and materials are available. 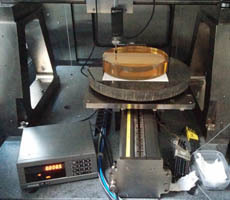 Flat optics can be measured to a diameter of up to 240mm and and accuracy of ~ 30 nanometers. 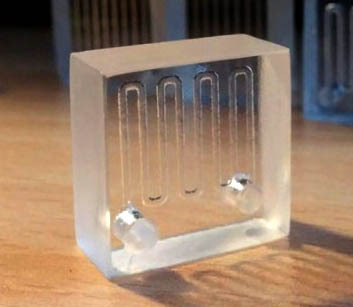 There is also a setup for measuring other types of reflective and transmissive optical elements. For more information on any of the above please contact me.